Background; Peritoneal metastasis is one of the most frequently observed incurable factors in patients with gastric cancer. The prognosis of patients with peritoneal dissemination is dismal, and chemotherapy, not surgery, is usually indicated for these patients. Recent advancement of imaging modalities enabled us to detect peritoneal metastasis preoperatively. However, the accuracy of preoperative examinations is limited and unexpected peritoneal metastasis is occasionally observed at the subsequent laparotomy. Today, staging laparoscopy is increasingly performed in patients with advanced gastric cancer to detect clinically not evident peritoneal metastasis, and it has been reported that staging laparoscopy can reveal peritoneal metastasis in 15 to 30 % of gastric cancer patients. The aim of the present study is to clarify the feasibility and limitation of staging laparoscopy. 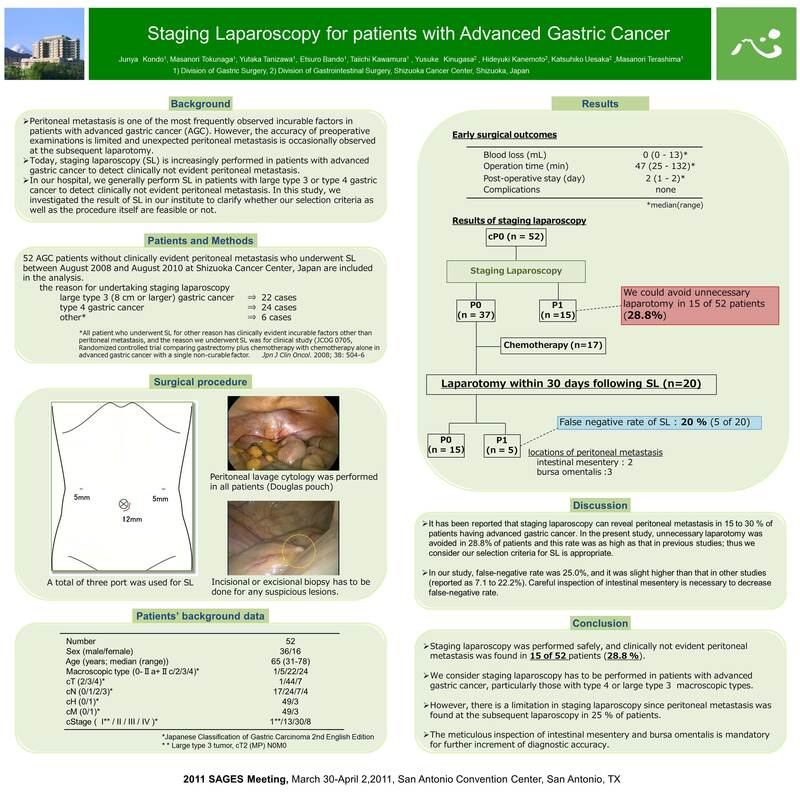 Patients and Methods; From August 2008 to August 2010, staging laparoscopy was performed in 58 patients with advanced gastric cancer at Shizuoka Cancer Center, Japan. Six patients with clinically evident peritoneal metastasis (cP1; all were diagnosed with computed tomography) were excluded from the study; thus remaining 52 patients without clinically evident peritoneal metastasis (cP0) were investigated in this study. As for indication, staging laparoscopy was generally indicated in large (8 cm or more in diameter) type 3 or type 4 gastric cancer. The procedure was performed under general anesthesia by using three ports including camera port. If patients had suspicious lesions for peritoneal metastasis, incisional or excisional biopsy was done for further pathological examination. In this study, patients’ clinicopathological data and surgical findings were collected from electric medical record. Also, findings at the staging laparoscopy were compared with those at the laparotomy in patients who underwent subsequent laparotomy within 30 days following staging laparoscopy. Results; There are 36 male and 16 female patients with median age of 65 years. Type 3 (22 patients) and type 4 (24 patients) were the most frequently observed macroscopic type, and preoperatively evaluated tumor depth was T3 or T4 in most of the patients (51 of 52 patients). The median operation time was 47 min (range; 25-132 min), and no peri-operative complications were observed. Of 52 patients, 15 patients (28 %) were found at staging laparoscopy to have peritoneal metastasis. On the contrary, 37 patients were diagnosed as having no peritoneal metastasis at the staging laparoscopy. Subsequent laparotomy was performed in 20 of these 37 patients for curative gastrectomy, and peritoneal metastasis was found in 5 patients (25%). The locations of peritoneal metastasis were intestinal mesentery in two patients and bursa omentalis in three patients. Conclusion; Staging laparoscopy was performed safely, and clinically not evident peritoneal metastasis was found in 15 of 52 patients (28 %). We consider staging laparoscopy has to be performed in patients with advanced gastric cancer, particularly those with large type 3 or type 4 macroscopic types. However, there is a limitation in staging laparoscopy since peritoneal metastasis was found at the subsequent laparoscopy in 25 % of patients. The meticulous inspection of intestinal mesentery and bursa omentalis is mandatory for further increment of diagnostic accuracy.